Recognising and dealing with “wicked” problems requires a paradigm shift in the decision making process by governments, planners and corporations. Eyeing growth and prosperity, state governments woo private investors. For this, they provide incentives such as tax breaks, import duty exemption and create special economic zones, hoping that these projects will jump-start growth. But in the last five years, several projects in India have been delayed or brought to a complete standstill by social, political and infrastructural issues. Land acquisition problems, rehabilitation and resettlement of farmers, and political issues such as Centre-State relations and changing governments – these have hit projects across the country. Among them are Tata Motors’ Singur project and Nandigram in West Bengal; and Vedanta and POSCO in Orissa. About 12 major steel projects by giants like Tata Steel, Essar, ArcelorMittal, JSW and POSCO have been halted because of litigations with land owners. Wicked problems get complicated if you use regular Operations Research methods, conventional governance or organisational structures to solve them. They require soft OR techniques and people with special skills of negotiations. The need of the hour is to recognise that these kinds of problems are wicked or messy problems and entrust them to people with special competencies. The concept of wicked problems was first introduced by Horst Rittel and Melvin M. Webber in their work Dilemmas in General Theory of Planning. “Wicked problem” is a phrase used in social planning to describe a problem that is “difficult or impossible to solve because of incomplete, contradictory and changing requirements that are often difficult to recognise.” Moreover, because of complex interdependencies, the effort to solve one aspect of a wicked problem may reveal or create other problems. A wicked problem has innumerable causes, is tough to describe, and doesn’t have a right answer. Issues that can be classified as wicked problems include terrorism, border issues with neighbouring countries, urban planning issues like building and zoning violations, slum settlements, issues in land acquisition and rehabilitation for industrialisation, and issues regarding the extent to which FDI can be allowed. Over the last 40 years, methodologies have been developed to deal with “wicked problems” or “messes” that are beyond the reach of the traditional, mathematical modelling methods of operations research (OR). These methodologies are structured and rigorous, but non-mathematical. Examples include Soft Systems Methodology (SSM), cognitive mapping/ Strategic Options Development and Analysis (SODA) and the Strategic Choice Approach (SCA). Collectively they are known as Soft OR, Soft Systems or Problem Structuring Methods (PSMs). Wicked problems get complicated if you try to use regular OR methods, conventional governance or organisational structures to solve them. They require soft OR techniques and people with special skills for negotiations. Wicked Problems cannot be solved completely; they can only be dealt with. Tata Motors invested about $ 350 million to set up a factory in Singur, West Bengal, with plans to roll out 250,000 small cars. However, the firm faced massive opposition from farmers, who were either not willing to part with their land or were unhappy with the compensation they were being paid. The farmers’ agitation was backed by the state’s main opposition party. Singur grabbed the media spotlight as the protests took a violent turn. On October 3, 2008, Tata Motors announced a pullout, stating that it would shift its plant to another state. The Tata-Singur issue can be categorised as a wicked problem by mapping the problem to the characteristics of wicked problems identified by Rittel and Webber. The problem involves many stakeholders with different values and priorities. The primary stakeholders for the Tata-Singur project are the Tatas, West Bengal Government and the farmers. 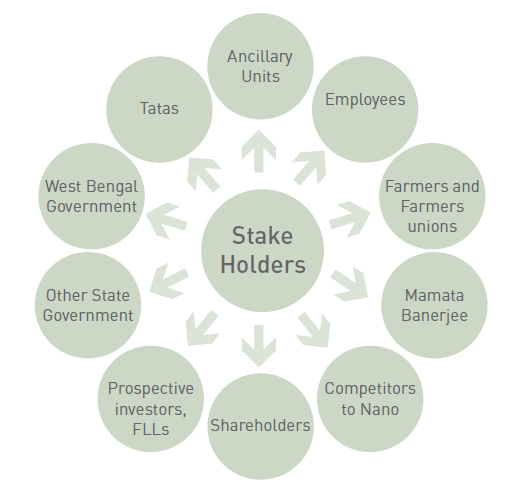 The figure 1 given above maps all the stakeholders associated with the Tata Singur project. The issue’s roots are complex and tangled. The cause for the Singur protests can be traced to the political scene in West Bengal over the past 25-30 years. West Bengal is an agricultural state with about 72 percent of its population depending on agriculture. The Communist Party of India Marxist (CPI-M) has been the ruling party since the last three decades. Industrialisation has suffered in the state. The current chief minister wanted to change course to keep pace with the rest of India. But conflicting concerns – of the farmers and the opposition party versus the government and Tata Motors – have complicated the issue. The problem is difficult to come to grips with and changes with every attempt to address it. In the wake of increasing protests by farmers over forcible acquisition of their lands, a petition was filed against the project in the West Bengal High Court. The court ruled that there was no procedural infirmity in the land acquisition proceeding. Instead of allaying the protesters, the verdict added fuel to the fire. Every implemented solution to the problem has consequences. After the farmers were paid compensation according to the then prevailing land prices and the project commenced, land prices in the surrounding areas increased by more than 200 percent. Farmers then protested that they weren’t adequately paid and needed more compensation. Even after the High Court pronounced a verdict in favor of the project, protests continued. Tata Motors quit Singur, after which several companies cancelled plans to set up shop in West Bengal. There is no right answer to the problem. Since every stakeholder, thinking from his perspective, is of the view that his solution is the only possible solution, there is no single right answer to the problem. There is no definitive formulation of the problem. Formulating the problem and the solution are essentially the same thing. Each attempt at creating a solution changes the understanding of the problem. The formulation of the problem in the Tata-Singur case is very uncertain. There are many speculations as to which is the main problem – providing more compensation to the unsatisfied farmers, returning 400 acres to farmers unwilling to part with their land or the intervention of political parties sidetracking the actual issue. The problem has no precedence. Though there are instances of similar problems, the environment differs and hence the same solution cannot be adopted. Nandigram may have been similar, but could not help avert Singur. This is because every problem is unique in itself and varies according to prevailing circumstances. There is no systematic procedure to solve wicked problems. Conventional processes like the sequential waterfall approach, algorithms and mathematical models fail to tackle wicked problems, and may exacerbate the situation. Wicked problems are different from hard mathematically programming problems (such as NP complete) for which approximate solutions are possible. 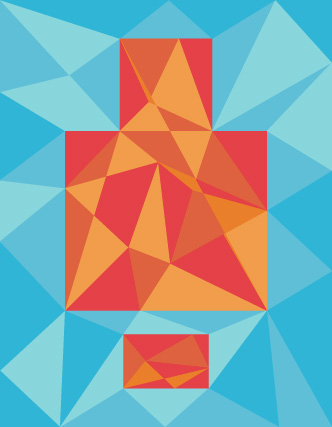 A variety of methods, collectively known as Soft OR, soft systems or problem structuring approaches, have been developed to help tackle wicked problems. After identifying a problem as wicked, all associated risks must be analysed and corresponding mitigation measures planned. This calls for people with different sets of competencies during different phases. The right kind of people, proficient in Soft OR techniques, must analyse the situation. Once a clear understanding of the problem is achieved, strategies – authoritative, competitive or collaborative – can be applied to take decisions. If power is concentrated in the hands of a small number of stakeholders, then authoritative strategies can be employed. Identification of this small set of stakeholders may rest on their knowledge and expertise, organisational position in the hierarchy, information power or coercive power. Whatever the basis for selection, other stakeholders acquiesce in the transfer of power to the “anointed” few and agree to abide by their decisions. Thus, when an organisation is engulfed in disputes over performance and future strategy, a chief executive officer (CEO) can step in and decide what path to pursue. In the Tata-Singur case, though an authoritative strategy was used by the West Bengal Government and the High Court, which backed the Nano plant in Singur, it was not effective because of the democratic nature of Indian society. Competitive strategies were employed by the governments of other states to attract Tata Motors. Taking advantage of the turmoil in Singur, the governments of Gujarat, Maharashtra, and Andhra Pradesh invited Ratan Tata to relocate the Nano plant. Tata Motors finally struck a deal with the Gujarat Government. Collaborative strategies are based on the principle that by joining forces, parties can accomplish more than they can by acting as independent agents. At the core of the collaboration is a “win-win” view of problem solving. Rather than play a “zero-sum game,” they assume a “variable sum game” that seeks to “enlarge the pie” for all parties involved. In the Tata-Singur case, the West Bengal government invited the farmers, opposition party and Tata Motors for discussion. The talks did not prove fruitful because of lack of proper negotiation skills. Currently governments and corporates do not have an awareness of wicked problems. They strive hard to solve these problems using conventional OR techniques. These only complicate the process and generate ripple effects, wasting precious effort, time, money and resources. The State or Central Government can – while sanctioning projects – outline the risks involved. Planners and corporates should recognise wicked problems and resolve them amicably in the initial stages by using teams of people with suitable negotiation skills. Clinical Professor and Executive Director of the Centre for Global Logistics and Manufacturing Strategies (GLAMS) at the ISB. 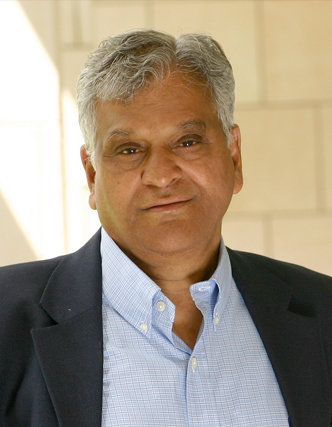 Researcher at the Centre for Global Logistics and Manufacturing Strategies (GLAMS) at the ISB.